Royal Lochnagar distillery in Highland neighbours the Balmoral estate in beautiful Deeside and was granted a royal warrant following a visit by Queen Victoria in 1848. Royal Lochnagar is one of the smallest distilleries in Diageo’s Classic Malts Selection and has been rebuilt three times. 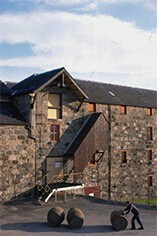 However, it has preserved its traditional distillery character - with its two pagoda kiln heads – and techniques (including an open mash tun).